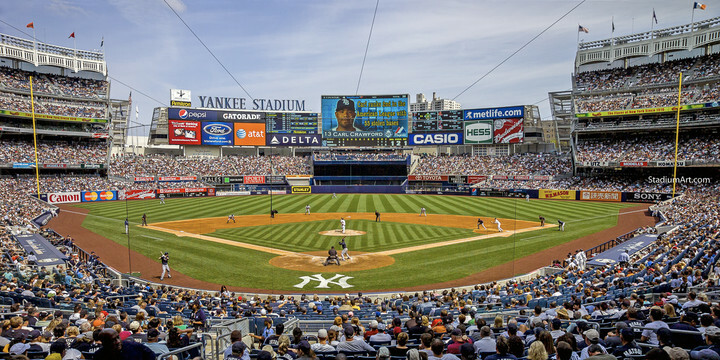 New York Yankees play baseball at Yankee Stadium in the Bronx New York. Previous baseball stadiums include Hilltop Park, Polo Grounds and two old Yankee Stadiums. Legends of the New York Yankees include Yogi Berra, Bill Dickey, Joe DiMaggio, Whitey Ford, Lou Gehrig, Ron Guidry, Elston Howard, Reggie Jackson, Derek Jeter, Mickey Mantle, Roger Maris, Billy Martin, Don Mattingly, Thurman Munson, Andy Pettitte, Jorge Posada, Mariano Rivera, Phil Rizzuto, Babe Ruth, Casey Stengel, Joe Torre and Bernie Williams. The fine art photos are available in various sizes including 11x14 photo, 13x19 print, 8x10 image and 40x30 canvas frame.